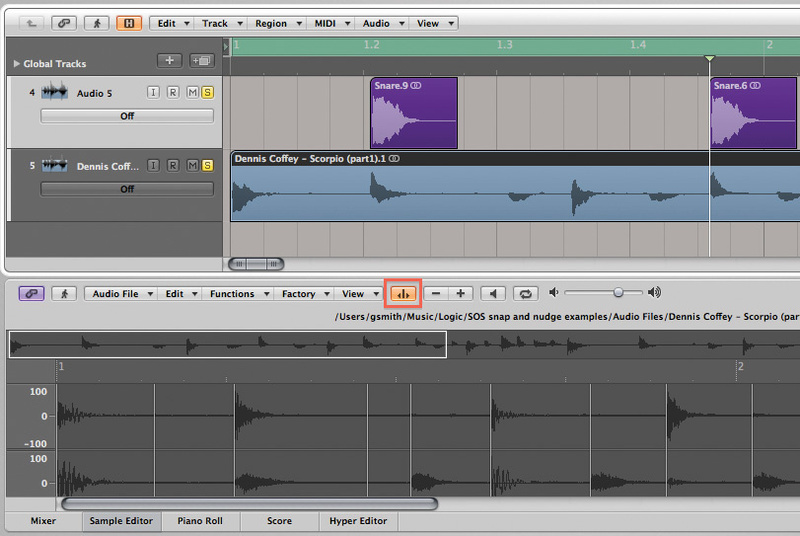 We're reading between the lines in Logic this month, with a look at editing using the snap and nudge facilities. In this month's column we'll be looking at using Logic's snap, nudge and transient detection facilities to improve workflow for basic data input and editing tasks, both on and off the grid. 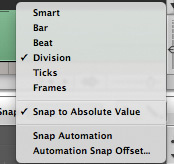 The snap function in Logic forces your editing actions, such as moving, copying, resizing and splitting, to Logic's timing grid, and choosing the right snap setting for the resolution you want to work at can help your workflow. 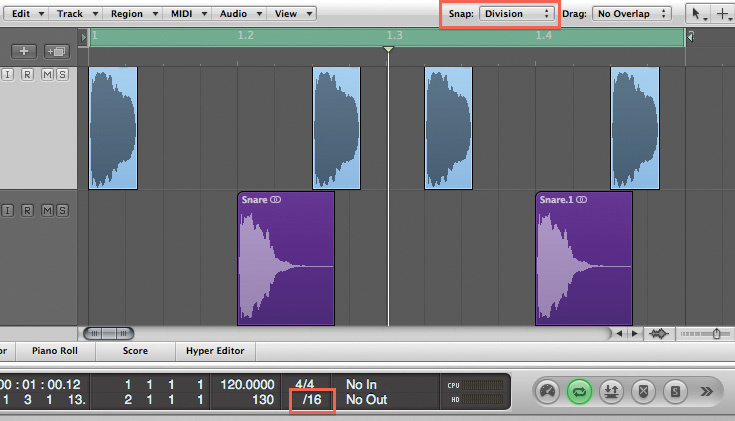 The Snap Mode menu in Logic is located at the top right-hand corner of the Arrange page. Its default setting is Smart, which tells Logic to try to guess the resolution of the grid you want your editing actions to snap to by how far you are zoomed in or out on the Arrange page. The other settings in the Snap menu are ordered in increasing grid resolution: Bar, Beat, Division, Ticks, QF and Samples. I find the most useful options to be Smart, Bar and Division. While most of the snap settings are self-explanatory, the Division setting is special, as it works in conjunction with the Division setting in the transport bar, using its value to decide what your editing movements will snap to. For example, if you set the snap mode to Division and the Division setting in the transport bar to /16, your editing actions will snap to a 16th-note grid. You can further configure whether your snapping actions will be relative to the original position or absolute to the grid using the Snap to Absolute Value option from the Snap menu. With this option unticked, all your snap actions are relative to the original position. For example, with a snap setting of Bar, a region being moved will snap to a bar to the left or right of its original position. With Snap to Absolute Value ticked, when you move a region it will go to the nearest exact bar line to the left or right of the region, regardless of the region's original position. When the Snap Mode menu is set to Division, your editing actions will snap to the value of the Division setting in the transport bar; in this case, 16th notes. It really helps to set up dedicated key commands to switch between the different snap settings, so that you can quickly toggle between them. You can also set key commands to raise or lower the Division setting in the transport bar, to change the snap resolution when using the Snap Division setting. Open your Key Commands window, using Option-K, and make a note of the snap mode and Division key commands. I have reassigned my favourites to the numeric keys above the alphabet. I have the Snap and Nudge key commands that I use regularly assigned to the numeric keys below the function keys. Just as useful as Logic's Snap settings are its nudge settings. The nudge settings are accessed by key commands and can work in conjunction with snap settings to make editing tasks easier. Once again, open the Key Commands window and assign key commands of your choice to the 'Nudge Region/Event Position Right by Division' command and its Nudge Left equivalent. Now let's use these snap and nudge key commands to help us programme drums with single audio hits. First of all, add a single kick-drum hit to an audio track on the arrange page. Next, set snap to Division and, in the transport, set the Division value to /16. 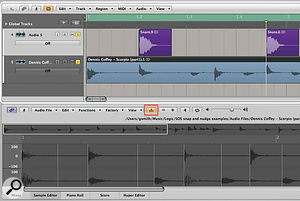 Now hold down Option and click-drag to copy the kick drum; notice that the copy snaps to the 16th-note grid. When programming drums using audio, it's well worth setting the Drag menu, which is to the right of the Snap menu, to No Overlap, so that when your kick drums overlap, Logic automatically shortens the preceding region. This is really handy for things like kick-drum rolls. You can then highlight all the regions on the track and, in the Region Parameters box, add a short fade-out to all of them to ensure there are no unwanted clicks. Carry on copying and placing the kick drums until you have created a two-bar kick-drum pattern. Loop a bar of your kick pattern and then hit play on your sequencer. Select a kick-drum region from within your pattern. Now use the 'Nudge Region Right/Left by Division' commands to change the pattern, moving the selected kick back and forward by a 16th note. You can use the arrow keys to move between adjacent kick-drum regions and then experiment with nudging those back and forth while you listen to the results. Make sure you're zoomed to view a whole bar. Change the Division setting to /12. You will see the grid on the Arrange page change to display 12 divisions per bar (ie. eighth-note triplets). Copy the first kick drum twice, so you have three adjacent kick drums. Notice that your editing actions now snap to triplets. Select the last kick drum of the triplet and change its position using the nudge key commands. Notice how the kick drum is now nudged by an eighth-note triplet backwards and forwards. When programming drums with audio regions, using the snap Division setting allows you to easily work in specific grid resolutions. You can then use the 'Nudge Region Position Right/Left by Division' key command to try out different patterns. The snap and nudge commands are just as useful when working in the Piano Roll editor, so create a new software instrument with accompanying region and double-click on the region to open the Piano Roll window. The Piano Roll window has its own Snap and Drag menus in the top right of the Piano Roll. By default, snap is set to Smart, but when drawing in notes and editing note lengths, I find the Smart setting difficult to use accurately on the Grid. Fortunately, Logic has an option to help with this. Use the key command you assigned previously to set snap to Division and ensure you have the Division value in the transport set to /16, then return to the Snap menu and choose the 'Snap to Absolute Value' option. This option ensures that when you go to draw in notes, or edit the length of previously recorded notes, they will automatically snap to the resolution you have set. In this case, all the notes we draw in will now both start and end exactly on the 16th-note grid. To temporarily override the Snap setting, holding down Ctrl and Shift while performing an editing operation, such as moving a note, sets the snap behaviour to ticks, whereas holding down just the Ctrl key will change the snap behaviour to Division. Option and the up/down arrow keys invokes the Event Transpose +1 and Event Transpose -1 commands, which move a note up or down by a semitone. Shift-Option and the up/down arrow keys invokes the Event Transpose +12 and Event Transpose -12 commands, which move the selected notes up or down by a whole octave. Let's look at one last scenario. When aligning audio events, we sometimes want to align the events to each other rather than to Logic's sequencer grid. To accomplish this, we'll make use of Logic's transient markers, rather than Snap options. In this example, I'm going to look at how to align a single-hit electronic snare to a sampled drum break: You can align single audio events — for example, layering an electronic snare drum with a sampled drum break in Logic — by using the Forward by Transient key command and pasting the snare at the playhead position. Drag a drum break onto a Logic audio track; my example uses the break from Dennis Coffey's 'Scorpio'. Double-click on the drum break to bring up the sample editor, and click the Transient Editing Mode button to activate it, so that Logic detects the Transients within the drum break. Now create a new audio track above the drum break and cut or copy an audio region containing an electronic snare drum to the clipboard. Move the playhead to the start of the drum break and click on its audio region so that it's selected. Now use the Forward by Transient key command and the right arrow key to move the playhead through the drum break. When you get to the transient of a snare drum, press the 'up' arrow to select the empty audio track and paste the electronic snare at the correct position. Press the 'down' arrow and Logic once again returns to the drum-break region. You can carry on using the Forward by Transient key command to take you to the next snare drum. Finally, if you need to tighten the timing of events within two audio tracks relative to each other rather than the grid, this can be accomplished using Flex Time. The method was outlined in the November 2009 Logic article, 'Using Flex Time on Vocals' (/sos/nov09/articles/logicworkshop_1109.htm). 2 weeks 1 day ago. Studer servicing in NI / ROI?